The latest clue to finding life on Mars may have lot in common with the salt on your dining room table. NASA’s Mars Odyssey orbiter has discovered evidence of salt deposits in 200 spots on the Red Planet, indicating that water was abundant in those places. Given the close connection between water and life on earth, these salt sites could be prime locations for proof of possible Martian life. Odyssey’s Thermal Emission Imaging System snapped thousands of pictures in a range of wavelengths that helped scientists see evidence for salt. 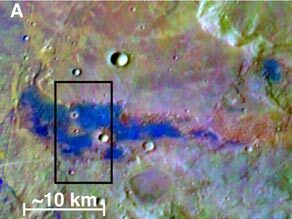 Only sites in the planet’s southern highlands, the most ancient rocks on Mars, appeared to contain chloride, a component of many kinds of salt. The salt deposits formed about 3.5 to 3.9 billion years ago, at a time when Mars may have had sporadic spouts of a wetter and warmer climate than the conditions observed there today, which are cold and arid. Images revealed many of the salt deposits in basins with channels leading into them, which is “consistent with water flowing in over a long time,” said Philip Christensen, principal investigator for the camera at Arizona State University, in a NASA statement. The salt probably didn’t come from a global ocean, as the sites of the deposits are disconnected, said team leader Mikki Osterloo at the University of Hawaii in the statement. But groundwater coming up to the surface in low spots could have generated the chloride sites, he said. Scientists trying to track down proof of life on Mars have largely followed clues of sulfates, which could result from the evaporation of water, and clays, which suggest weathering by water. Chloride now joins the mix of leads to follow for scientists seeking close encounters with remnants of past Martian life forms. The researchers published their findings in a recent issue of Science, just days before the shake-up about a possible $4 million budget cut from NASA's Mars Exploration Rover program. I always find it interesting that although finding salt on mars sounds really boring (yawn...) it could actually be pivotal in deciding where to look for life. Another reason why funding for Spirit and Opportunity should be INcreased, not decreased. I think organic (carbon) compounds would be more indicative of proof of life, not salt. Salt can be formed from geologic processes, and fluids eroding geo-strata, but definitely not a guarantee of life. We will find the evidence for life we are looking for, but salt deposits are not it. Why are you telling us something our gov. has known for years. We are so desperate to look and sound like we are on the verge of something historical. Find the planet that E.T. 's and U.F.O. 's are living and breeding a most powerful civilization. Tell us something we should be informed about with respect to our galaxy. If there are E.T. 's and UFOs they are probably tens if not 100s of light years away. The only way we're ever gonna get there is by the USS Enterprise, which obviously isn't gonna happen. How To Know If You're Compatible? A lovely and positive way to greet the new year.